It’s one of our chefs’ favorites! All of our authentic Orleans Method vinegars are available in our special "food service for the home chef" size. For those who want more product, want less packaging, all for a better value…here it is in our half-gallon size. We have long been fascinated with the idea of marrying the sweetness and complexity of wine grapes that have been left on the vine to concentrate the flavors and natural sugars, with the bright and crisp acidity of authentic Orleans Method vinegar. 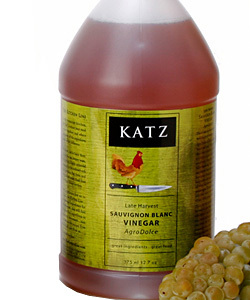 Our KATZ Late Harvest Sauvignon Blanc AgroDolce Vinegar, which means sweet and sour in Italian, gives you the best of both worlds and will add new dimensions to your cooking.